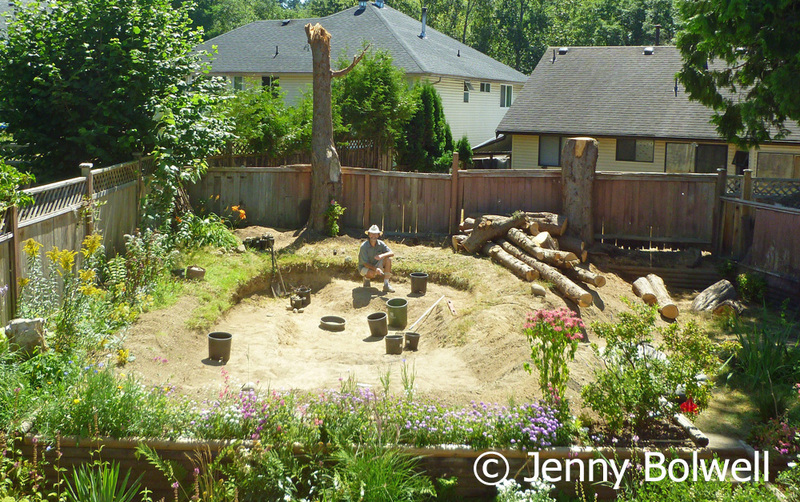 The Natural Garden – Building a Pond for Wildlife Photography. 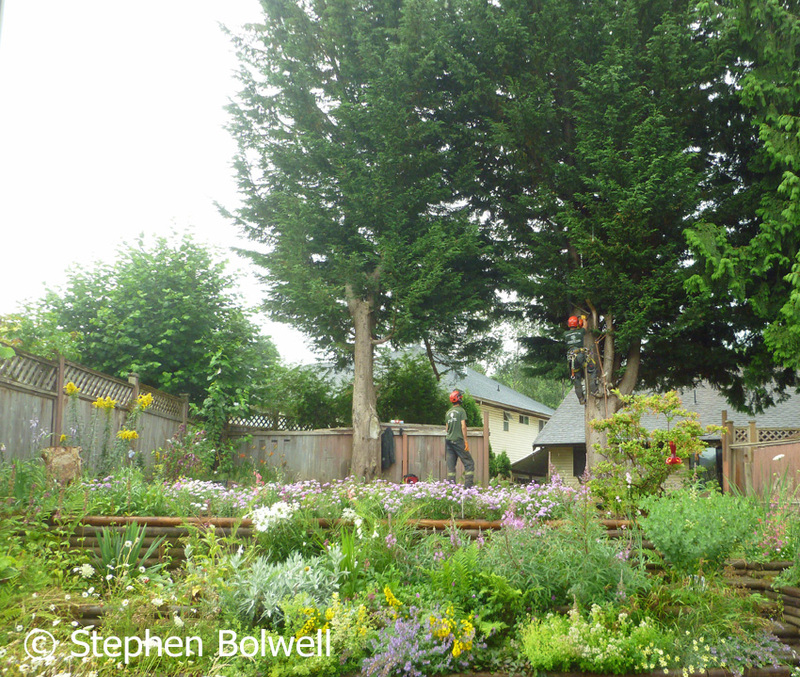 I presently tend a mid-sized suburban garden just south of Vancouver; close to the coast and the U.S border, with the climate about as temperate as Canada has to offer. Rarely is the weather extreme and it rains fairly regularly. All things considered, not a bad place to tend a garden, but ours has one glaring oversight… it doesn’t have a water feature.. 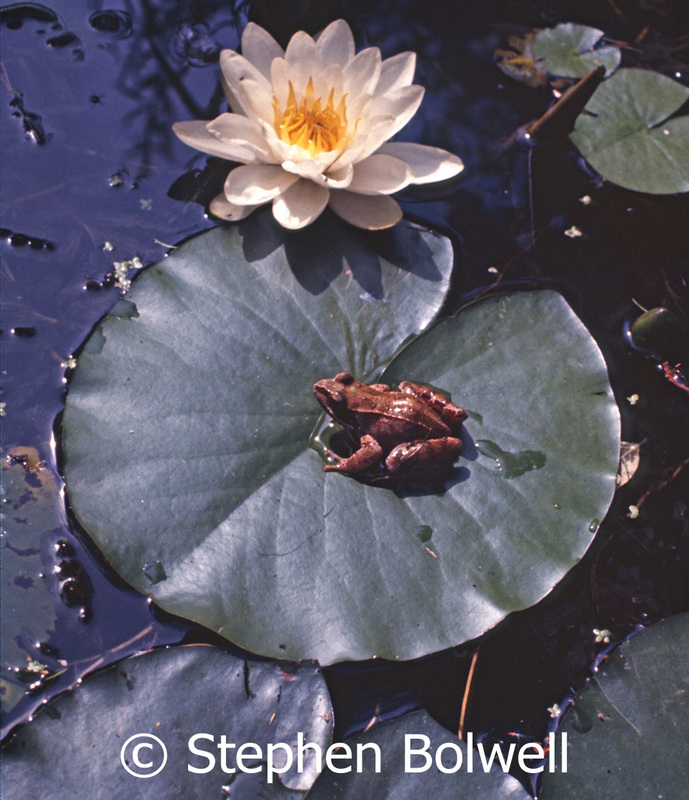 It was fairly common to see a frog following fairytale rules during summer, in the first pond that I built in my parents garden, when I was a teenager. I’m fond of garden ponds and over the years have built several – mostly using concrete, which usually provides a sense of permanence; but the pond I am presently working on has been dug in soft sandy soil, where it is more practical to use a pond liner. This will be the biggest pond I’ve installed so far, with a surface area of a little under 600 square feet, an area that is expansive in relation to the whole garden – a situation that provides one major advantage… it takes up space, reducing the amount of land that would otherwise need tending in a more traditional labour intensive way; and in addition, a larger pond that has both shallow and deeper water, where pond plants are plentiful, will stabilise as a viable eco-system more quickly than a smaller volume of water. 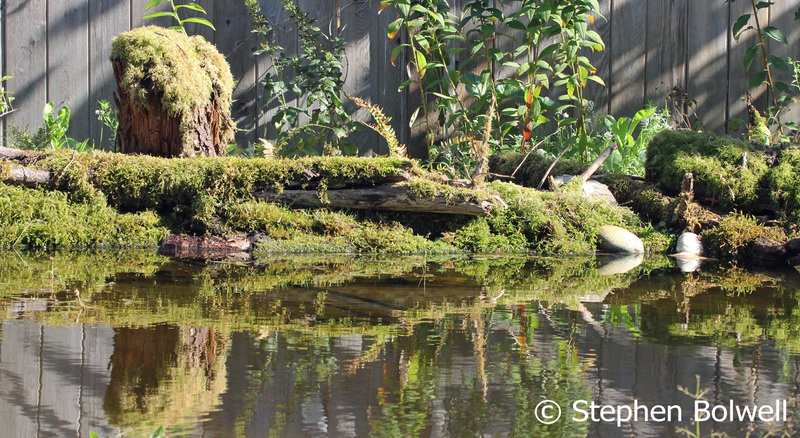 It’s good to have a natural pond in mind during construction, but there are no plans to build a miniature version of the wild. The intention is to steal ideas from nature, which, with the benefit of time, has worked things out pretty well. 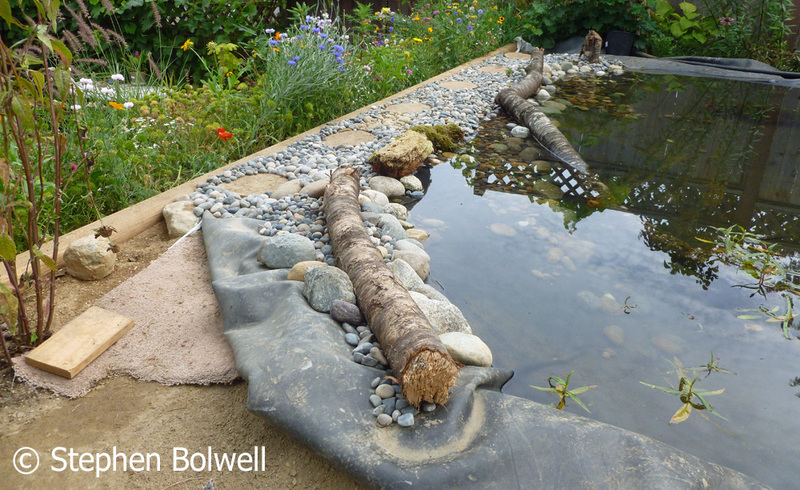 There are many good reasons for creating garden ponds; they will certainly increase the bio-diversity of urban spaces and improve things by as much as a third. The presence of water can be calming and my wife sees the value in that, but my interests are related more directly to wildlife photography, and a naturalistic pond will allow me to take pictures of plants and animals living in and around fresh water without having to travel more than a few metres from the house. ‘They’ being wild animals… mostly small creatures such as amphibians and insects – in particular the ones that rely upon water as an integral part of their lifestyle needs. When flora an fauna are biologically committed to what you have on offer, it is difficult for a project to fail. 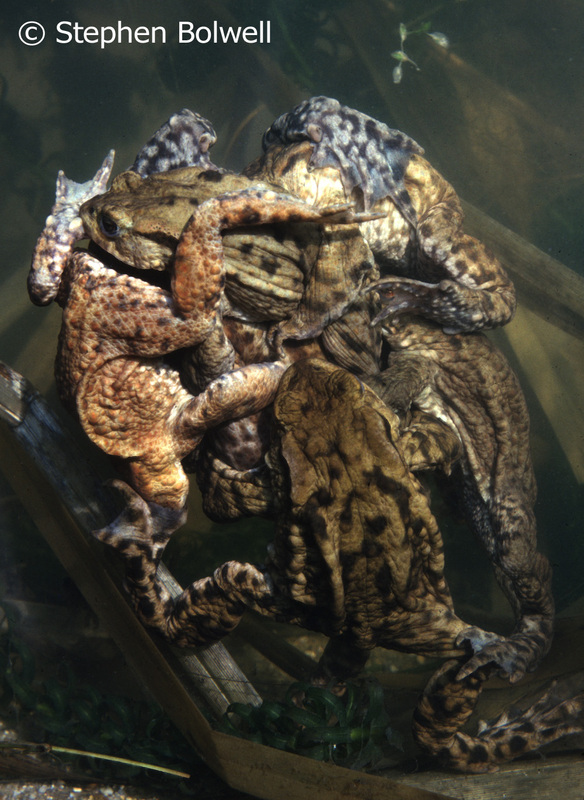 During the 1970s and 80s I regularly photographed and filmed European common toads spawning in my parent’s garden pond during early spring, but sadly, their numbers have gone into steep decline in recent years. The difference between the pond that I am creating and many others is that I am committed to a natural look, and will use the skills I’ve learnt over the years to dress the area appropriately, so that it might double as a film set. In summer it will be necessary to cut back weed growth, and during fall scoop leaves from the surface, but there won’t be the continual round of weeding, planting and mowing common to most land based garden areas. During our time in New Zealand I didn’t have time to built a pond. We just had a bucket on the deck – even with such a minimal amount of water it is surprising what shows up. I haven’t been slow to move the pond along during the autumn months, but will admit to digging the pond over a longer period of time, due to a troublesome back, and also because I have quite a lot else to do. However, it would be wrong to suggest that the process has involved a lot of hard work, because the soil here is light and sandy, although there has been quite a lot of it to move. Had I started the project in our front garden, with its heavy underlying base of slipper clay and shallow top soil, I doubt I would have made much progress without a mechanical digger. The area I did chose could not have been more different, at the back end of the garden the soil is fortuitously sandy and runs to a considerable depth. On the down side, heavy machinery would have been difficult to operate here without crumbling or compressing the soil, especially with my lack of experience with a digger. But as most of us can work efficiently with a spade if we have the time, I didn’t see a problem and did my best to view this arduous process as very good exercise. The selected site in the back garden dropped about a foot over its length and I used soil from the back end of the excavation to build banks up the front. This was essential because a pond on a slope is technically a river and the water will always end up somewhere else. A spirit level was therefore an essential tool, but I did little more than run a taught string from front to back and make regular checks to gauge where the future water level would be. Before starting I had to get a permit to fell two trees – the remains of a long gone badly managed hedge, they were now a danger to my neighbours property, and situated on the southern border of our property, they cut out the light. To make a success of the project, both would have to go. Overall, a garden pond doesn’t need to be very deep, but a better balance can be maintained if in some places it gets down to around a couple of feet in depth. This is best achieved near the centre and not at the edge. A gentle gradation from around the sides is far more natural, and important for a variety of reasons. Water plants require different depths depending on their preferences – some will do best with just their roots in water – water buttercup for example; others such as water lilies and bogbean need to be totally submerged, and will push their leaves and flower stems up to the surface during the warmer months of the year. 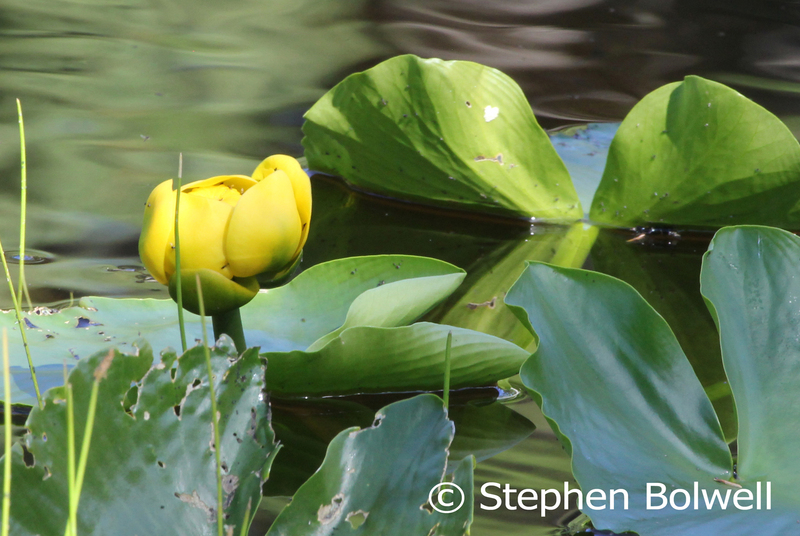 The Yellow waterlily Nuphar polysepalum is a native water plant (although it may originate from the eastern side of North America). In contrast, many colourful water-lilies are introductions. It is very important to exercise common sense in any garden where pets and children are spending time: if smaller children in particular are playing close by, a pond should always be covered with some form of supporting mesh. 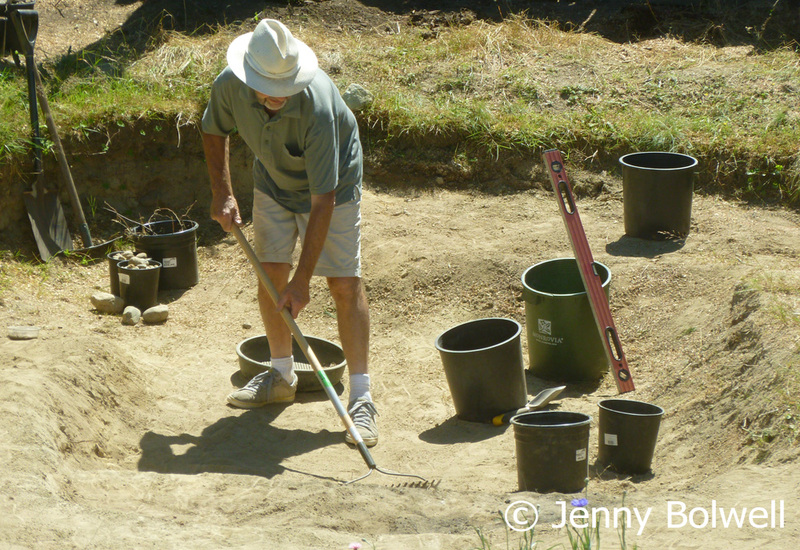 When the dig is complete I am keen to move the process along as quickly as possible and sort out the surrounding garden. This will involve everything from new fencing covered with climbing plants (which will improve and soften reflections in the water), to organising the border areas as sympathetically as possible, with the back half of the garden given over to native flowering plants that will help draw in local wildlife. Here the digging out is almost completed. The stump of one of the felled trees has been left to rot out naturally, and a bird nesting hole with an interior nest site has been created at the top. There are also slits for bats and a vine has been planted at the base to eventually cover the old trunk to make it more aesthetically pleasing. With the trees gone there is now enough light to maintain a healthy pond. 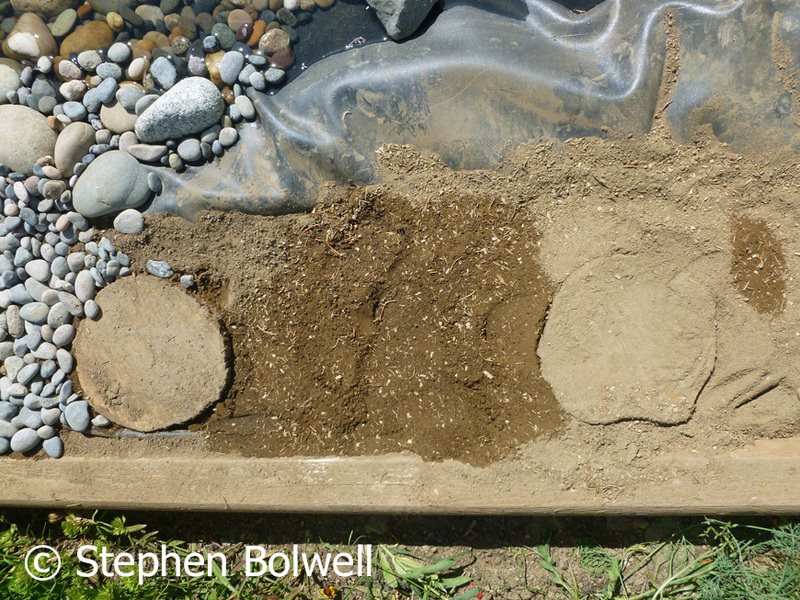 Another good reason for proving shallow slopes into the water is to create a place where insect and amphibian larvae can develop without high levels of predation; hungry fish in particular are a problem and won’t be introduced into our pond. This will also prevent the nitrification of water from fish poo, and reduce algal blooms. I appreciate that the temptation to introduce fish will be too great for some, but if the intention is to boost pond bio-diversity, goldfish, koi and any other large predators should be avoided. 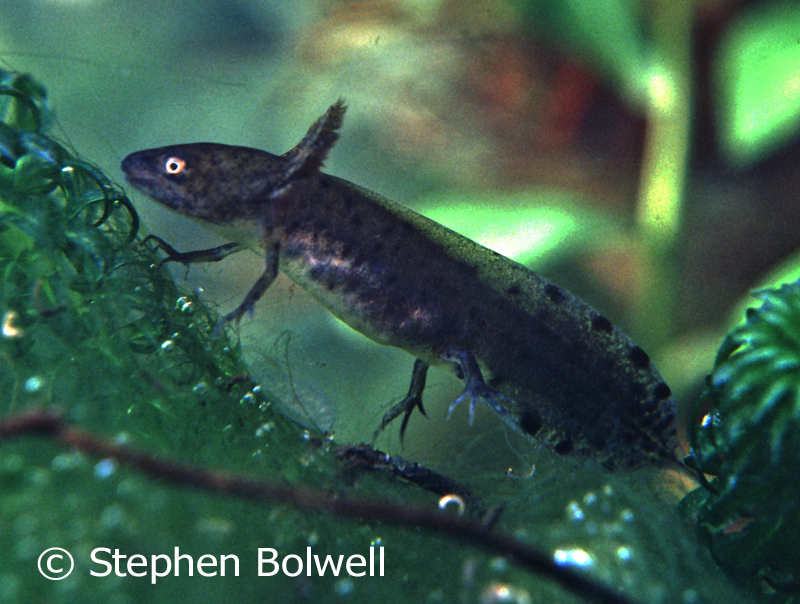 Salamander and newt larvae can be voracious predators eating almost any other creature smaller than themselves. In direct sunlight shallow areas will warm more quickly than deeper areas. It is a broad generalisation tin natureo claim that chemical reaction times will double for every 10 degree rise in temperature; as with biological systems there are limitations as to how warm an organism can get before it become physiologically stressed, but there is no doubt, that over a small range, amphibian and insect larvae will develop more quickly when conditions are warmer, providing there is adequate food and oxygen. The quicker that a larva develops, the better are its chances of survival, and the very first to hatch and begin growing may end up feeding on late starters, and certainly this is the case for the young of many amphibians. 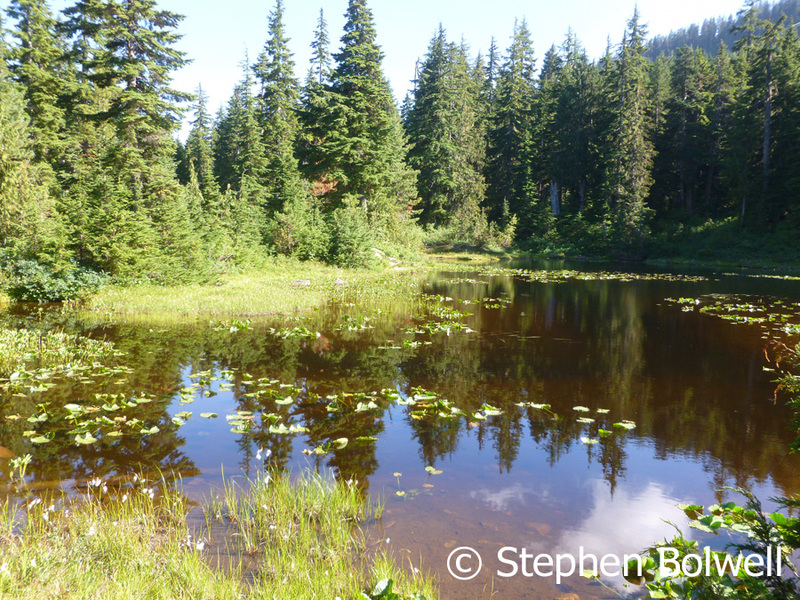 The strategy has been developed by many species living in small ponds that will dry out during the summer months. 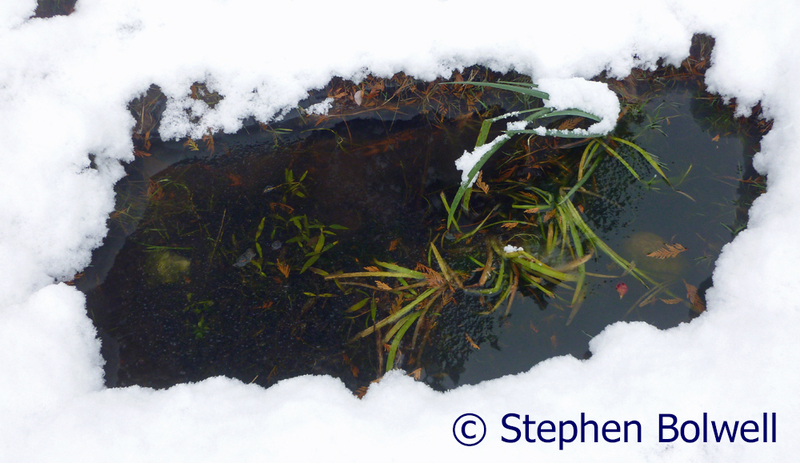 Garden ponds are not usually allowed to do this, and that’s another good reason for not introducing large predators into a garden pond – they flourish until they have eaten everything else! Even though the pond base is sandy, and I’m using a quality 1 mm thick pond liner, every inch of the base and sides has to be sifted of stones. I start from the centre and work out and admittedly, this is a time consuming drag, but essential if the rubber base is to be protected. Done properly, it will improve the chances of the liner surviving for 25 years or more. 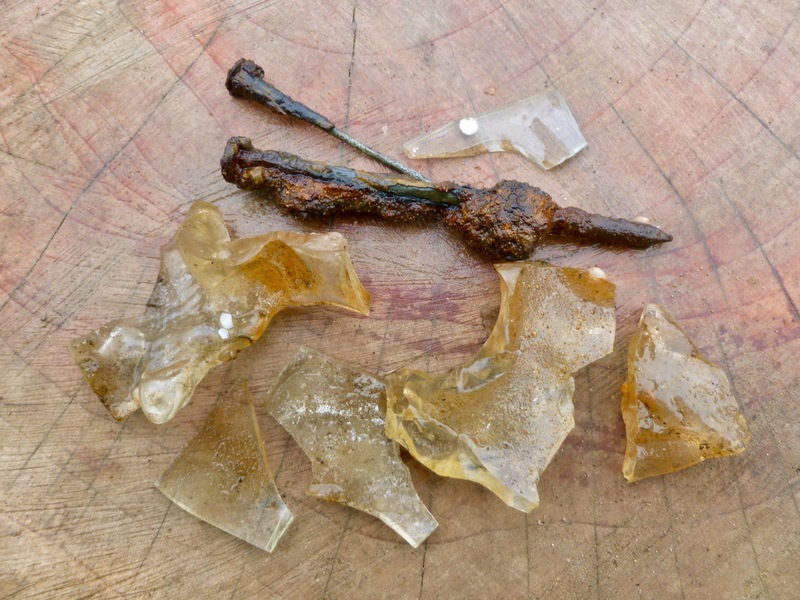 There was clearly a burn and bury here – probably when the house was built – to clear rubbish, and all had to be carefully removed as rusty nails and twisted shards of glass will puncture any pond liner. When I started working on the inside of the house, I saved the old carpets to line the pond. I don’t like anything synthetic going onto soil, but a degraded carpet layer can be cleared if the pond is ever decommissioned and certainly it is more useful here than in landfill. The liner in place, the pond was filled with water, allowing it’s weight to contour the rubber liner – aided by some judicious tugging to flatten out creases. Many people will empty a new pond after a few days and refill it, but that’s a terrible waste of water and quite unnecessary if you can live without fish. There is nothing much else to do once the liner is organised and I start getting plants in well before the pond was filled. I had already installed a very small pond in our garden when we moved in, using a small piece of liner bought in the mid 1980s. It was a remnant from a larger pond installation, and has travelled around the word with me for a good many years to become part of many temporary sets during the filming of small animals. In its latest incarnation I’ve managed to grow on various small aquatic plants that can now be moved across into the newly completed pond. It is a good idea to visit a local pond after a storm and remove small pieces of vegetation that have broken from the various water plants that live there, but it is necessary to get to them before the ducks do. It is unwise to bring plants in from a distance as what suits your area best will be growing locally, and it is very important not to introduce pest species. Almost anything you need can be bought from an aquarium shop, but who knows where it has come from? If a friendly neighbour is having a pond clear out, it is wise to make use of it. 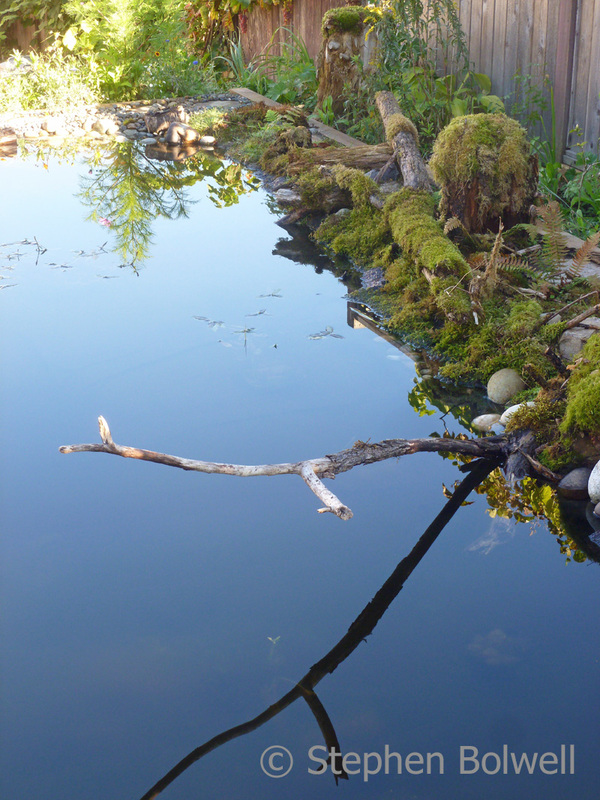 Where I live in Canada, garden ponds are less common than they perhaps should be; and where they do exist are often too ornamental and busy with goldfish to be very helpful to native wildlife. 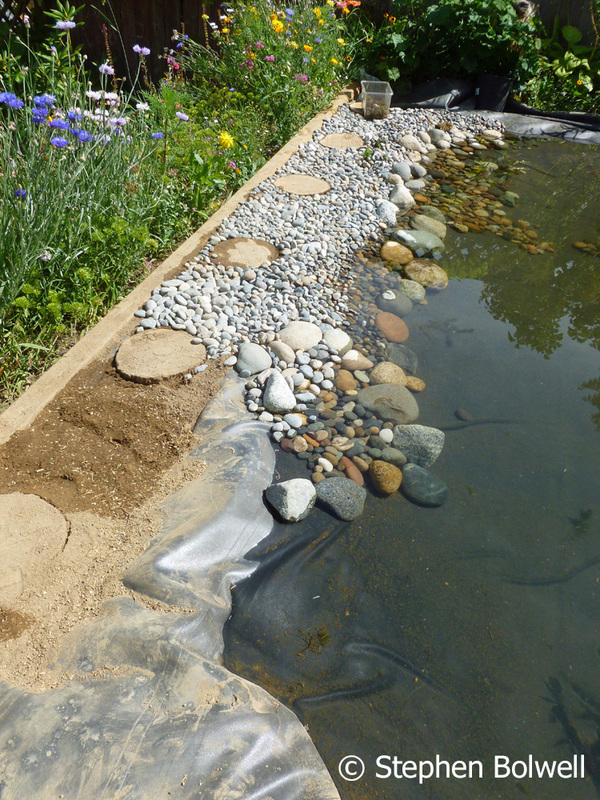 There is a small hump at the edge of the pond that prevents garden run off; once over this the depression behind is filled with a layer of sandy base soil, this is then covered with layers of smooth stones. Finally, small plants are added to grow amongst them. This wet area at the front of the pond is essentially a pebble beach. But along the back and sides I have used mosses and ferns that are commonly found in the damp rainy conditions of our area, many of these have been grown on by placing fallen branches in shady areas of the garden. Each of us might use what is natural to our own area. I try to make my mini-landscapes appear as realistic as possible. Over the years I have build a lot of sets that have been used to photograph small animals and I approach the pond decor with the same attention to detail, but with the understanding that in this case things need to be more permanent. I begin to make use of the cut trunks from the felled trees by cutting cookies to walk on – none are placed on the liner itself, and all have a protective pad of thick rubber beneath them. The job is certainly painstaking, because every stone that goes into the pond or comes into contact with the liner has to be hand selected. Using sand and stones in this dipped peripheral area will reduce nitrogen run off into the water and help prevent algal blooms. 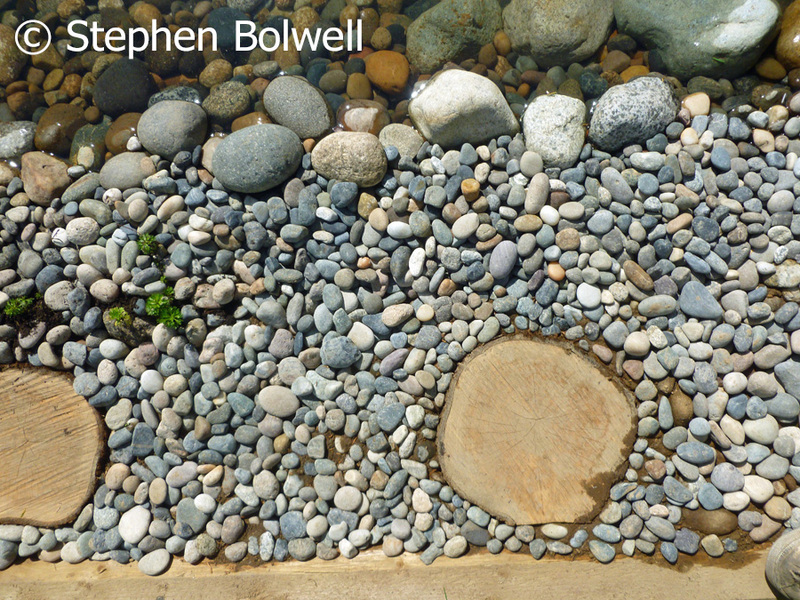 To make things look natural, larger stones need to be clumped together as if a stream or river had perhaps arranged them hundreds or even thousands of years ago – rather than somebody like me having done so yesterday. At this point I am about half way to creating the illusion of a pond just a few days after the digging process has been completed. I will move the fallen branch temporarily and hack away at the ends to provide a more natural look. Obviously, sharp tools must never be used anywhere near the rubber liner. Some might consider my efforts to be on the verge of theatre with a distinctly theme park feel ,which is true only up to a point, after the liner is installed everything above it is quite natural and many plants will creep across hard surfaces, especially where there is water, and as roots grow and interweave they will eventually hold the basic structure together. Up and just over the hump that separates the land from the water I have used moist play pit sand to form a base, because it doesn’t contain much in the way of nutrients (especially if it has been washed thoroughly), which might otherwise flush into the pond. The liner forms the base of a gully that lips up along the backside to retain water and conditions moist, acting as a suitable substrate for more primitive plants – such as mosses and ferns, that might be grown there. 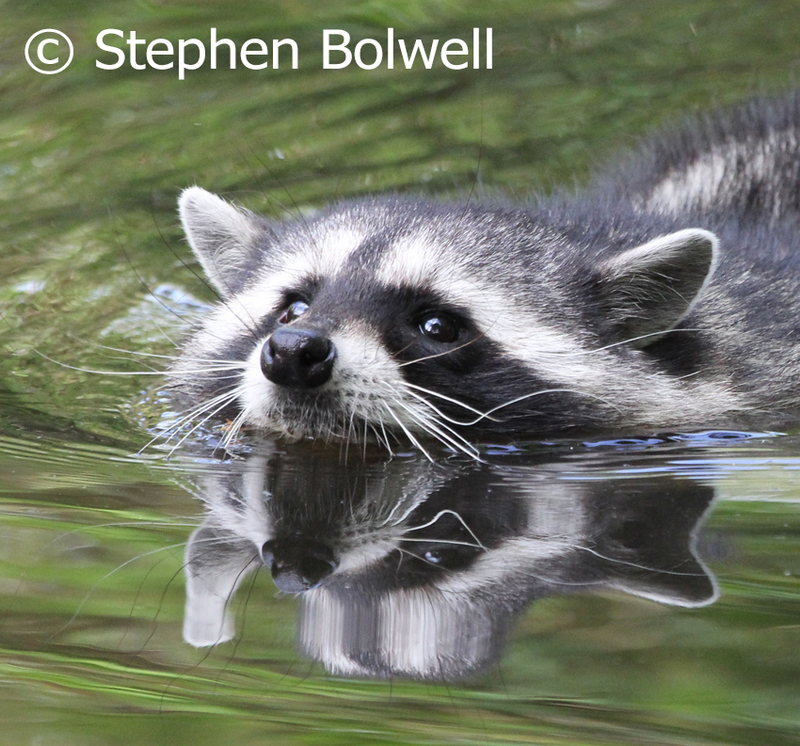 I haven’t seen a raccoon at the pond in daylight, but I’ve seen them from the bedroom window in moonlight and they love re-adjusting the plants in their familiar post-apocalyptic style. The stones are layered deep enough for the liner to be well covered, but they won’t stay in place if a raccoon or some other creature visits and decides to shift them around, but that’s true of any part of a garden that has been visited by any beast that arrives with the malicious intent of a masked marauder, as raccoons so often do. They are not always welcome, but I tolerate them. Other than the wild animals drawn to the pond, I will be the only one walking along the cookies to micro manage the environment, so I won’t have to worry about guests falling in. This is presently be an illusion of the natural world, but the longer things are left to themselves, the more natural they will become; and increasingly provide a habitat for a great many animals, that although small, will play their part in this developing ecosystem. It was no trouble to stash moss covered logs for a couple of years when the garden was shaded by the now felled trees. Repositioned close by the pond these mossy supports remain healthy because the pond overflows directly into the gully keeping things moist along the edge of the pond in the places where I didn’t cut back the liner. Most pond building advice suggests that you should trim the overlap, but I prefer to make use of it wherever possible. This peripheral area will remain mostly wet, but will require a little watering during the dryer months of the year – although this will be more of a spray than a thorough dousing. Less than a month from the end of the pond dig one side of the pond has been realistically dressed. Once the fences are covered in climbers, the background reflections in the pond will create a very natural feel and the sky reflected in the surface adds another dimension to this new environment. The pond was finished before fall began to make its presence felt, and this is a good growing time. I begin moving plants from my small nursery pond as soon as I can, and achieve quite a lot in only a few days. The partially established water-plants quickly increase their root and leaf systems under the new conditions. If plants grow well without too much help, it is a sign that you’re getting things right. Winter came early on November 3rd with an overnight snow flurry, bringing an abrupt end to the many insects that had survived though what has, up until now, been a mild fall. The little supply pond I use to establish small water plants, now looks a little sad with the sudden change of season. 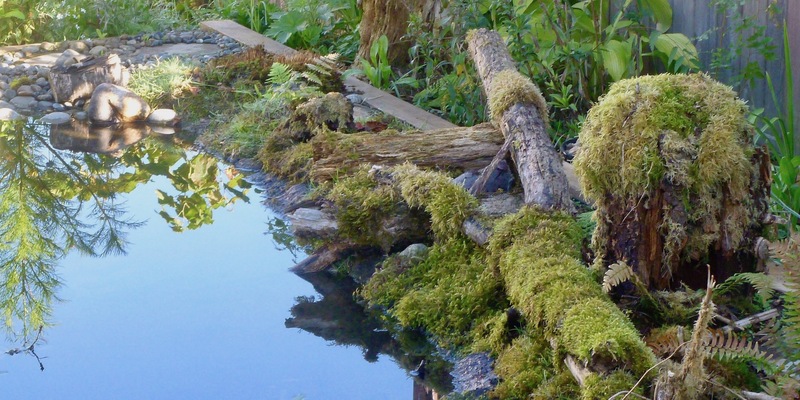 I notice most people who give advice on pond construction are particular about giving lists of plant and animal species, but these details will depend very much on where you live. My pond is arranged around the local flora and fauna, and you might do the same. If that is the case, you should be aiming to attract what is common close to where you live – if for example, a plant is local there will be other organisms that thrive in association with it. All you are essentially doing is creating a web of natural interactions and it isn’t necessary to know every detail to make this work. If you chose to be observant, expertise and those tricky Latin names will come with time – but this isn’t essential, especially if you don’t find it easy to remember cumbersome nomenclature – a system mostly used to convey precise details to others. It is however worth checking out your local invasive weed species in order to avoid introducing them. Any animals that can fly will arrive of their own accord, but don’t introduce amphibian spawn or larvae unless you are sure of which species it belongs to. 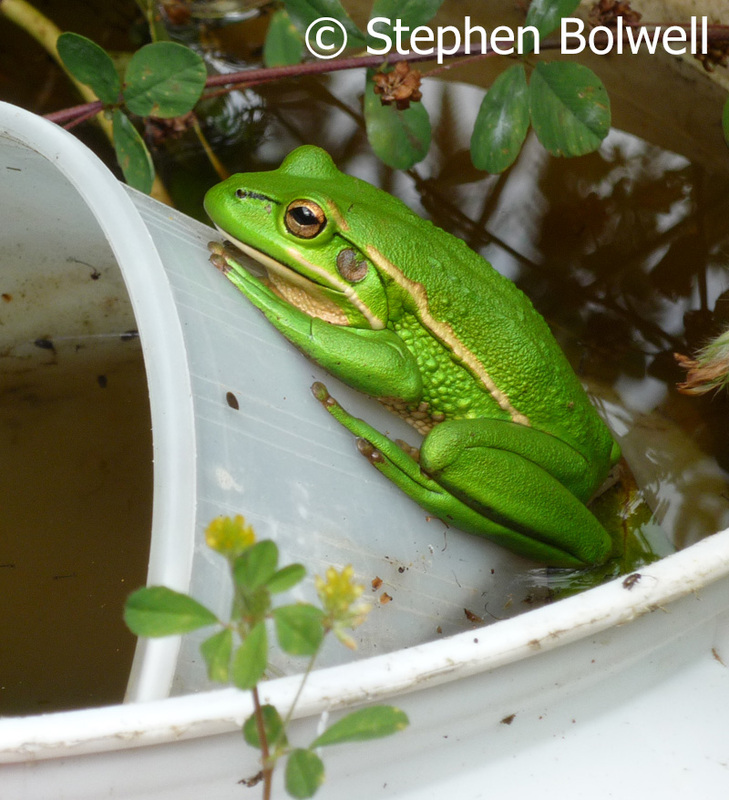 In my area the last thing I want to do is introduce alien bullfrogs which will eat most of the smaller native species; there is also a very real problem with amphibians of spreading disease, so it is essential to understand exactly what you are doing before you attempt a relocation. 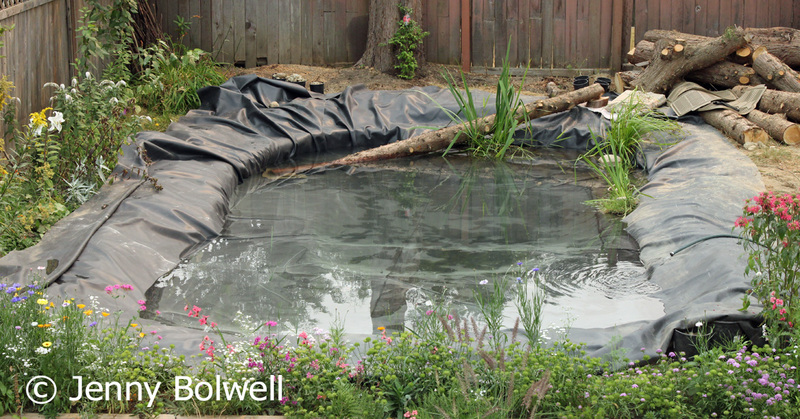 The was the pond only a week or so after the liner was installed. A Wooden divider prevents the more fertile soil from the garden washing into the pond, but it cannot be seen from the opposite viewing side… I know – it sounds like a theme park without the carriages, but really it’s just gardening! 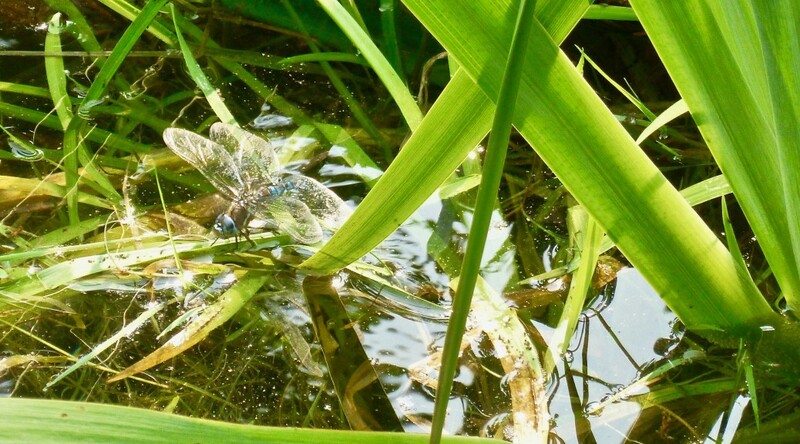 The best bit of the whole process for me, was when dragonflies of both sexes showed up and the females began laying eggs on water plants within the first two days of the pond being filled. When such things happen it is impressive and reminds us that nature can be extraordinarily persistent. If you want to keep things like this, remember you still have to do a bit of micro weeding, but that should be fairly minimal – and if it goes a bit wilder – nature won’t mind. Get it right and any of us might make a difference to the natural world. If you decide to build a pond of your own, don’t forget to record what you have achieve by taking pictures – you might influence others to follow your example. And remember, when something new and interesting shows up, it will be you that made it possible. Please do not dig up or remove any plants from protected areas. Flora and fauna will usually establish naturally in your garden once you have provided a suitable habitat. Next Time: My New Garden Pond – What Showed Up in the First Four Weeks: Dragonflies and Water Boatmen and the Best Way to Photograph Them.